One thing that we first noticed about this weeks episode was how quickly it went past. It is a little shorter than the normal episode but even so it flew by. Just dust him off and we can then head towards the goons. That and the amazing Robin and, more importantly, his hair! We also learn that Colton has finally recovered enough to not need a nurse hanging around him but he does need to get armed as, his friend, Bruce has warned him of a plot to kidnap him ( Even if that’s the entire part of this arc of the serial ). A little derringer hidden up the sleeve as well as a normal revolver is all he needs as protection. I wonder if that will be used later in the episode? Meeting the police, our heroes discover the mug shot of one of them. After that, it’s a drive to the Hotel and to meet Mr Colton again in his room. On the drive, or Mr Colton is visited by a doctor who says that Linda Page asked him to visit. Is this starting to spell a bit strange? He manages to persuade Mr Colton that he needs to be examined. Examined in a way that involves a rag covered in some knock-out liquid. 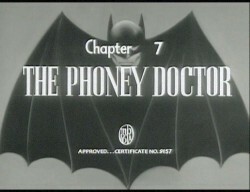 The doctor then just dumps the vital piece of evidence that The Batman may find. That then could lead us to the lair of the japs. Then again, we may have to stay tuned and be back next week to find out what happens. Just as our Mr Colton is being drugged, shoved on a stretcher and carried to an ambulance to be taken to the “Hospital”, our heroes are racing to the hotel in their car. What will happen when they get there? Not much, just a bit more of the plot and they then now know what has just gone on whilst they have been on their way over! After discovering an odd odour, and then tracking it down to the handkerchief that our Phoney Doctor was using, our heroes now go off to the lab to see if there are any clues as you can’t get finger prints off linen. They do this by a new “Black light process” that tells us all that it was washed in a Chinese Laundry. That one run by the Japs by any chance? Now our Mr Colson has arrived out our evil lair. Well searched and stripped of all of his weapons? All we need to do is waft some smelling salts over him and he just comes around. That and a brain dump so they can claim jump him. That and the conversion into the mechanical zombie that are radio controlled. With as incompetent staff as our evil Jap boss has, Mr Colton hasn’t been fully disarmed and ne now takes our evil Jap hostage and makes a break for freedom. That works well until he gets brained by one of the “Waxworks”. The one that is actually real and works as the door guard! We do discover that the laundry is just a front where our evil Jap boss holds some of the supplies that we may need in next week’s episode. A change into The Batman & Robin and a roof entry leads to the end of episode fight and The Batman left in peril as a lift car descend to crush his unconscious form. How will he survive? Find out in the next exciting episode!